If you’re receiving an email from us for the very first time, I want you to know that there’s a war being waged against our Second Amendment Rights in Minnesota, and it is reaching a fever pitch. Bloomberg’s militants in our legislature, combined with his paid front-groups like “Moms Demand Action,” are angling into position to pass ‘Red Flag’ gun seizures and Statewide Gun Registration. Speaker of the House Melissa Hortman will soon cram these bills through the Minnesota House, and the battle will move quickly to the Minnesota Senate. That’s why Minnesota Gun Rights has had extensive meetings with Senate Majority Leader Paul Gazelka, but I’m afraid we have bad news for gun owners. Republican Senate Majority “Leader” Paul Gazelka, after we explained how perilous his position is, doesn’t want to stand up and fight. MGR staff even provided a road-map to victory, outlining a step-by-step plan to fight back and stand tall for gun owners! But alarmingly, Republican Senator Majority “Leader” Paul Gazelka informed us that he has absolutely no intention of fighting back — and instead has gone on the attack against Minnesota Gun Rights’ members and supporters for putting pressure on him. ➜➜ He has zero intention of yanking lyin’ Senators Scott Jensen or Paul Anderson back in line – when both of those Republican senators supported these gun-control bills last session. ➜➜ He has zero intention of forcing Big Gun Control on defense by passing a Stand-Your-Ground bill. 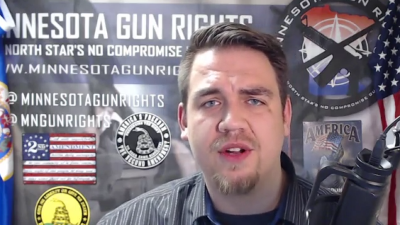 Sadly, it’s up to you, me, and thousands of our gun-owner friends across Minnesota to Stand and Fight! If gun-control is to be stopped in Minnesota, it will only be because gun owners banded together and FORCED our Senate into blocking Bloomberg’s maneuvers. So join with us and demand that your state senator stiffen their spine and VOTE NO against Bloomberg’s ‘Red Flag’ gun seizures and Statewide Gun Registration using our pre-written message. Our Action Center is simple to use and will take you less than 30 seconds to send your pre-written message. Please don’t wait – Act NOW! If you’d like to hear the full story about the fight for gun rights in St Paul and Senator Gazelka’s refusal to lift a finger for gun owners, feel free to watch the video below! To watch this video on YouTube — CLICK HERE! To watch this video on Facebook Live with the rest of the online gun rights community — CLICK HERE! Whatever you do, please fire off your PRE-WRITTEN email right away and help us stop this gun control freight train! To make a contribution and help us bring more gun owners into this fight — GO HERE!